A new devotional practice that is part prayer book and part armchair pilgrimage – from the classic novena that is a favorite of Pope Francis. 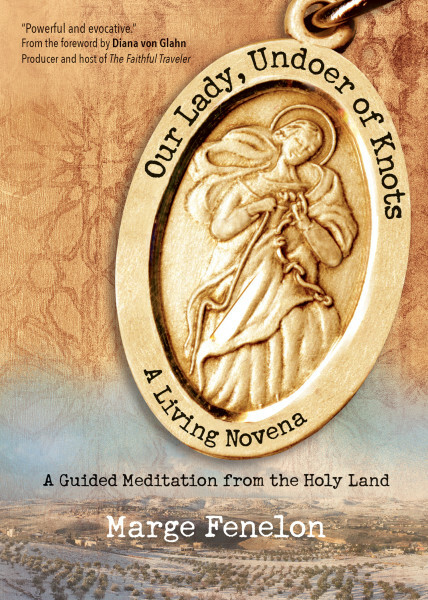 Our Lady, Undoer of Knots: A Living Novena is a unique guided meditation from veteran Catholic journalist Marge Fenelon, who has created a new devotional practice from this classic novena that is a favorite of Pope Francis. Since the seventeenth century, Catholics facing seemingly insurmountable obstacles have turned to Our Lady, Undoer of Knots through a special novena–nine days of prayer for divine intervention. Catholic columnist Marge Fenelon resurrects this ancient tradition, also known as the Unfailing Novena, by reflecting on nine sacred sites associated with Pope Francis’s 2014 pilgrimage to the Holy Land. Reflecting on such holy places as Bethlehem, the Mount of Olives, and the Temple Mount, Fenelon helps readers explore the “knots” or impossible situations in their own lives in order to find peace. Ecce Mater Tua – Behold, Your Mother; Marian Stations of the Cross ON SALE NOW!